What to Do with $500 Tax Refund: High-End Sneakers or Savings? It’s no surprise that Foot Locker store sales spike every year during the months of February, March, and April, even during the years of the recession. Company executives attribute the shift directly to consumers receiving tax refunds that coincide with the yearly release of collectible Jordan sneakers. This year’s hot new drool slated to release February 2, 2013: The Air Jordan "Year of the Snake," a pack of two pairs of Jordans. The two styles (Air Jordan 1 or Jordan Melo M9) retail for a cool $300. 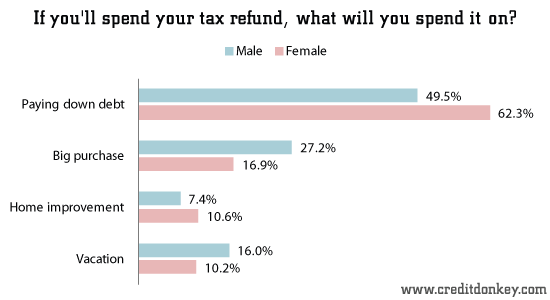 Of our survey respondents, 44.1% expect a refund of $500 or less this year. And that’s just the perfect amount for splurging without buyer’s remorse. Sometimes the mind can justify spending a small windfall that might not make much of an impact on savings balances. However, some taxpayers plan to act more cautious this year. 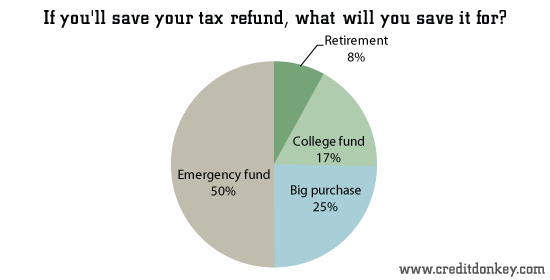 Of the respondents who said they will save their tax refund money, 50.1% will deposit their check in their emergency fund. This is a very smart thing to do with a windfall of even a few hundred dollars, according to personal finance experts. They overwhelmingly advise that having at least $1,000 in a savings account can really cushion the blow of unexpected expenses, such as sudden car or household repairs. These emergencies can push people who don’t have cash on hand to rely on credit cards without the ability to keep their balances low. Other savers will use their refund as a way to save for a future, big purchase. Nearly 25% of savers have some purchase in mind. As for the rest of the savers, 17.45% will use their check from Uncle Sam toward college savings, and 8% will use it for their retirement funds. When we asked the 43.9% of respondents who said they plan to spend their refund, 54.2% of them said they plan to pay down debt with it, which of course is a smart thing to do but isn’t much more fun that saving it. 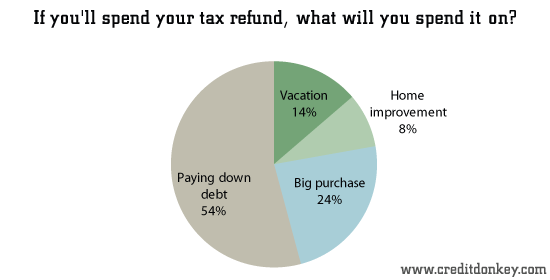 Only 23.6% said they plan to make a big purchase with their tax refund money. 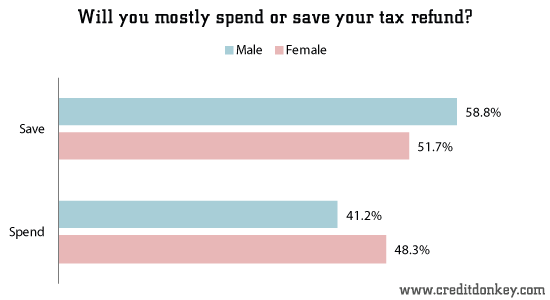 Women spenders are more likely (62.3%) to pay down debt, versus 49.5% of men. Let us know what you plan to do with your tax refund. Leave a comment about Survey: Tax Refund Statistics? 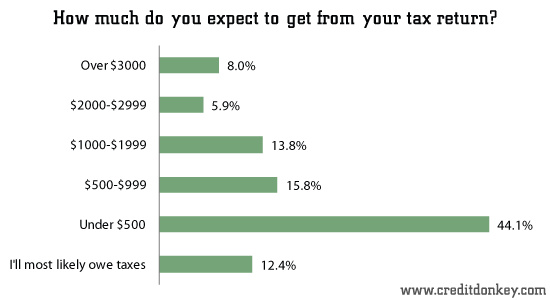 Share on Facebook "Survey: Tax Refund Statistics"